Lipcon & Lipcon, P.A. ; David W. Lipcon, Esq. R.R., a minor, only nine (9) months old at the time of the incident, was with his mother, grandmother and older sister at a Hamburger Restaurant in Dade County, Florida. The plan was for the family to go to the restaurant, have some lunch, and take the baby Christmas shopping for his very first time. The four (4) of them had gone up to the register, and ordered breakfast/lunch. Included with the order was a large cup of coffee. After placing the order, the family sat at a table. They were told that a waiter would be by soon with the food. R.R., was sitting on his mother’s lap, with his sister to the left, and his grandmother directly across the table. After a brief wait, the waiter skated up to the family’s table, carrying a tray. The server was very anxious and fast in how he placed the food on the table. He seemed to have been in a big rush. Without thinking of the danger, he negligently placed the large cup of coffee, scolding hot, and filled to the top, in front of the baby, and his mother (although it was the grandmother who ordered the coffee). Immediately after placing it, he turned, and then knocked over the hot coffee, spilling it all over the baby’s chest, arms, and legs. The spill caused immediate burns and pain to the baby. Thinking quickly, the mother immediately removed the baby’s clothing, dried up the hot coffee and called 911. The baby was transported to the hospital for treatment. 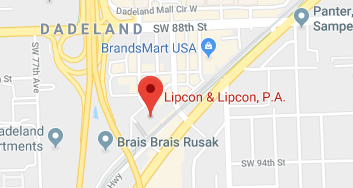 R.R.’s mother, hired Lipcon & Lipcon, P.A., a Miami Law Firm that has been specializing in Personal Injury Litigation for decades. Mitchell J. Lipcon, Esq., now of counsel with the firm, has been practicing for over forty-eight (48) years. David W. Lipcon, Esq. has been practicing in this area of law for over twenty-two (22) years. Almost a year after the incident, the case was finally settled for a confidential amount of money. The money is to be put in a structure/guardianship account which will grow significantly (and guaranteed a certain rate of return) until the baby turns eighteen (18). The settlement is protected by the court. David W. Lipcon stated, that while he cannot say the amount of the settlement, due to a confidentiality agreement, he is happy to report that the amount was so significant, that the baby will have a secure financial future which will include the ability to pay for college, grad school, housing, etc. The baby has made a very good recovery from the injuries and is expected to live a full and productive life, with little or no consequences from the incident.